-The battery bank configuration is something I'm still trying to understand. It's equipped with: four 6-volt golf cart batteries + one 8D battery + two 12 volt AGMs up front for bow thruster. They seem to be wired oddly because I can't seem to isolate voltages between the banks on my DC panel gauge. Even if I switch to just #1 or just #2 they borh seem to decharge evenly. Also I've determind that the Port engine starts off bank #1 & Starboard off #2. Genset starts off either. 1. Whats the lowest voltage i should allow the batteries to reach before kicking on the generator? 2. I've read that generators are inefficient at topping off the last % of a battery. And that's where solar is ideal. So at how many volts is the max that i should bother running the gen? 3. I've read that it's important to not run a generator at too small of a load. How do I determine what that load is? 4. I have room on my flybridge hardtop for 1000 watts more of solar. Would the rest of my current components be able to properly handle that increase -- or even just 500 more watts -- or would i need to upgrade inverters & controllers too? 5. Is it important to get the batteries back to 14 volts regularly? Or is 12.5 - 13.5 ok? 1) 11.5 volts and lower is considered full discharged from my understanding. I wouldn't let them drop below 11.8v but I am conservative when it comes to electrical. 2)True. The Genny should be able to get them up above 13 volts. I would use a good charger instead of directly off the genny. Around 13.5 to 14v is fully charged, at least thats what my last marine charger indicated. 3)I've never heard of that so I can't answer that question. 4)I have only helped do a few solar installs. The ones I helped with installed higher rated charging equipment than the amount of solar installed. 5) Yes, they need to be brought back up to full charge. Any less and they can be damaged or developed an issue where they won't take a full charge. I'm having this problem currently on a vehicle I own. The battery tests fine, but won't take a full charge. I had a bad regulator rectifier and it was shorting the charging to only 13.5 volts. The battery only has a resting voltage of 12.8 volts. The vehicle starts on it, but slowly, and has an erratic idle until the battery charges back up after starting. 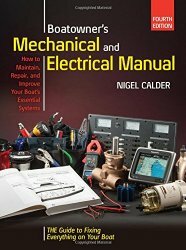 Listen,.Go find Nigel Calders' book on boat maintenance. Don't do as anything else or solicit opinions. This is too important. Listening to opinions such as the one preceding my answer will get you onto trouble. Get real info and figure it out. Calder's book is worth 1000 times as much as you will pay for it. Your questions are good. Get the real answers from a Pro. 1. Whats the lowest voltage i should allow the batteries to reach before kicking on the generator? 12.1-12.2 is 50% discharged (with no load on it) and that is considered the lowest you want to go for best battery life. 2. I've read that generators are inefficient at topping off the last % of a battery. And that's where solar is ideal. So at how many volts is the max that i should bother running the gen? Run it up to about 14.0 which is about 85% charged. Realize that your inverter/charger is a little low for 440 AHs of batteries so it will take a while to get there. A 100A charger would be more efficient, ie take less genset running time. 3. I've read that it's important to not run a generator at too small of a load. How do I determine what that load is? You want to run a generator at 33% or greater. The best way to know the pct load is to install an AC ammeter. 4. I have room on my fly bridge hardtop for 1000 watts more of solar. Would the rest of my current components be able to properly handle that increase -- or even just 500 more watts -- or would i need to upgrade inverters & controllers too? Your current 500 watts of solar should be able to top off a 440 AH bank from 85% or 14.0 volt charging voltage to 100% on a sunny day. It will probably take 14.5 or more to fully charge your batteries. You should do that at least every 3 days for best life. Many of your questions relate to state of charge pct. The only real way to know is with a battery monitor that measures amperage and integrates to amp hours. Xantrex, Victron and others make them. On a previous boat I had a 440 Ah house bank connected to a 2,000 watt/100A Xantrex Freedom charger powered by a small genset. I didn't have a battery monitor but I have used them on other boats and can pretty well relate battery voltage to approximate SOC. I would use the batteries to power house loads overnight and at the morning they were down to 60-70% SOC. I would start the genset to charge the batteries and make coffee, toast a bagel, etc, but not all at once- they were staggered to not overload the genset and keep the load at 35%+. After running for about an hour I got the SOC up to about 85% so I turned the genset off. The solar panels would bring them up to 100% during the day and the cycle would start over. A genset with a decent sized charger plus a few hundred watts of solar panels is a great combination for a cruiser hanging out at anchor. You need to buy Nigel Calder’s book. Your knowledge base isn’t sufficient enough to fully under stand the answers or what the right questions are. This is not meant to sound insulting. A lot of what you are saying is correct but I can tell by your questions you are missing some key information. Let’s just take one item. Low voltage, are we talking about the voltage on the guage or temperature corrected voltage, are we talking about a battery fully loaded or with no load. Before we even address these questions you really need to know how your battery banks intermix with each other and your charging sources. Yes, you are correct that you should not run the genset for extended times at a small load, it isn’t good for the genset. As to the rest, you have been given excellent advice in that based on the questions you are asking, it appears that you are getting in over your head with redoing your electrical. Again I am not trying to be insulting but in order to make the solar upgrade, you need more expertise. Nigel Calders book is a good place to start learning. Good luck. I would get a good battery monitor and learn how to use it. A battery monitor will show you how many amps are actually going into the battery. Run your generator as long as the batteries are actually absorbing plenty of amps (for example 10 amps or more). Once the batteries are no longer accepting a large number of amps, turn off the generator and let the solar handle topping off the rest. If you spend most of your time at anchor, it is best to run the generator in the morning to get the batteries up to this level. Then during the day, the solar can work to get them closer to 100%. If you spend all of your time on the hook, it can be really hard to ever get your batteries to 100%. This is not good for your batteries. If you spend a few days on shore power running your charger every week or two, it will solve this problem. Adding more solar will not help in this situation. For the last 10% or so of battery charge, the batteries do not accept that many amps, but they need a continuous trickle for 24-48 hours. It is hard to provide this with solar alone. Adding more solar would just allow you to not use your generator for the bulk charge portion of the charging, but that only takes a few hours and is a good use of your generator. I do think it is important to understand how your batteries are wired and how the various banks are charged. You need to make sure that all of them are getting charged properly when you are charging. I see that too, when my batteries are fully charged. It panicked me the first few times it was full sun and I wasn't seeing 15 or more amps incoming. Now, as long as my batts are where they belong, it's okay. Also, regarding Calder's: It is indeed the Bible for boat owners. I don't know if I have ever been aboard a long term cruiser who didn't have the book aboard his boat. Buy the 4th Edition incidentally. What I have found, and I'm not an expert, is that often it takes more than one reading for me to comprehend what he's saying. It is straight-forward. I just don't understand like I did when i was younger. Anyway, give yourself time, and have patience while learning. For the record, when my batteries are at 12.4 I start to power-save. I don't like my batts to get to 12.2. That worries me. I use the least expensive Lead Acid batteries from Walmart on my Seaweed incidentally. This is good advice for about half the population. I hope the OP is in the right half. Really good advice and a great place to start. i didn't realize until it was too late that I had to fully charge my batteries, so I kept them in the range of 50% to 80 or 90%. That worked for a year until it didn't. Also, OP, you need to read your voltages after the batteries have "rested" which means not being charged or discharged for some length of time. I've noticed that even a minute will give me a good reading, 10 minutes better, 1 hour great and 12 hours best. It's a logarithmic function, so after you take all the draws off the batteries, the voltage recovers quickly and will continue to increase but ever more slowly. When I first got my boat, one of the first things I did was reorganize the battery banks (which were a bit like yours). I made one very big bank and used individual batteries for the engine and gen. I kept the bow thruster on the house bank. How to tell your generator load? Measure it. Spend the money to buy a clamp-on AC/DC ammeter. I can't stress enough to read the specs carefully for one that measures DC Amps 40A and 400A scales. This is so useful for troubleshooting problems I feel every cruiser should own one. Once you know the current and the voltage, you can calculate the power (volts X amps = watts). The DC Amps will even tell you which DIRECTION the current is flowing. Amps used by loads like refrigerator, water pumps, windlass, davit hoist, auto pilot drive motor, starter motor current, etc. Amps supplied to batteries by solar panels, chargers, alternators, wind generators, etc. Generator output, shore power cords, ground leakage currents, etc. AC Loads like air conditioner compressors, blowers, water pumps, water heaters, etc. What is needed is a gas gauge for your house bat bank. These are called SOC (state of charge) meters and are the easiest way to keep track of the house set. Voltage watching works very poorly, with many limits, and for most a hydrometer is a big PIA . Calders book is worth the price , in advice on saving electric and perhaps providing more , or at least a better recharge rate. The Bogart is one of the least expensive SOC units that does the job. There are different ways to accomplish the end goal. OP, looks like you got your question answered, so a little thread drift.. A friend of mine raised two kids on a Cal 45, full time live a boards and knows his systems well. I was asking him a few questions last weekend about batteries. He told me he has all of his deep cycle batteries wired in one giant bank in parallel, and no separate starting battery. Curious if anyone else does this? Re#3 Low load or extended idle is not recommended but you do what you have to do. You an plan to use other electrical loads while charging if that makes you feel better. Interestingly we don't see reports here of failures related to low loads. Once you run it for a while at heavy load a lot of carbon will clear up. OP ERTF says he has a Link 2000 installed for inverter control. My previous boat's Link 2000 is also a smart regulator for charging by Freedom 10 inverter/charger, and a battery AH monitor as well. You may want to get/read the Link 2000 manual. I have it in PDF form, can email if you need it. ...He told me he has all of his deep cycle batteries wired in one giant bank in parallel, and no separate starting battery. Curious if anyone else does this? ahhh, the ultimate in simplicity. Rather like a single engine plane over the ocean. 1. extended, unintended draw brings the boat down to a zero energy state. ie, the bilge pump stayed on for 5 days, since the switch stuck due to some oily bilge mud. 2. if one cell, on any battery shorts, it will eventually cause problem 1. 3. starting transients will appear on electronics. you only need one voltmeter. I actually found the suggested Nigel Calder book in the stack of cruising guides that came with the boat. Also, yes I believe the Link 2000 should give me alot of the real time data many posters are suggesting I need. It wasn't powering on when I bought the boat. Then a captain ran a jumper wire to get it working, so I have had that interface this whole time, but not sure if anything needs to be setup or calibrated in it. I do have the manual so that's actually my 1st order of business -- ahead of reading that book. I'm sure I'll be back with more questions after I've had time to dig into things more. Thanks. Lately, everything I have learned over the years of being in various businesses has turned out to be false. I am going to have to re-educate myself. Links to the battery forum at DIYelectriccar.com. The most extreme battery talk I have seen for lead acid batteries. Just a point of interest.